The way to turn a wall or other influential position into a framework is to extend from it along the side. Here for example Black 1 makes very good use of the wall to the left: most of the side is now Black's framework, and if White plays in it Black can attack strongly. 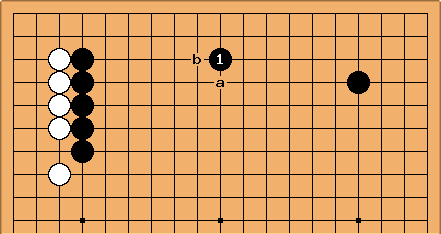 Putting it another way, White would be very happy to establish a group just in the same area where Black has played, for example by playing a wedge. Black 1 could also be at a, with more emphasis on the centre. But at b would be too close to the wall: see extension from a wall for the basic ideas about how far to extend. Bill: Takagawa makes the point that there are basically two kinds of walls, those with eye potential and those without. Those without eye potential require an extension. Otherwise, they can become heavy. For those with eye potential, an extension is non-urgent. Maybe an example would be nice? See Star point, 3-3 invasion.